NJP member cards with no admission fee and no annual membership fee. New Japan Phil Ticket Box and New Japan Phil Ticket "NJP-MEMBERS CARD" is issued to those who purchased tickets at regular price online. Please make use of NJP Members Card which offers benefits free of charge and no annual membership fee. 1. Each ticket is 10% OFF! 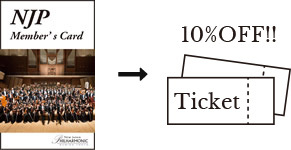 Each ticket of the New Japan Philharmonic Orchestra can be purchased with a 10% discount. ※There are exclusion performances such as ruby <afternoon · concert series>. For details please contact　New Japan Philharmonic Ticket Box. 2. Discount at affiliated restaurants near the hall! When presenting the card, we will discount 5% from the price of food and drink at all the following stores. ※Except for lunch time, some menu is not available. Room charge will be reduced by 20% from the regular price and the charge at each restaurant in the hotel will be 5% discount.